Putin showing off his artistic talents. President Vladimir Putin spent the first day of the new academic year visiting a Kurgan region school where he answered questions about state exams, sat in on classes and bizarrely drew a picture of a cat's backside. 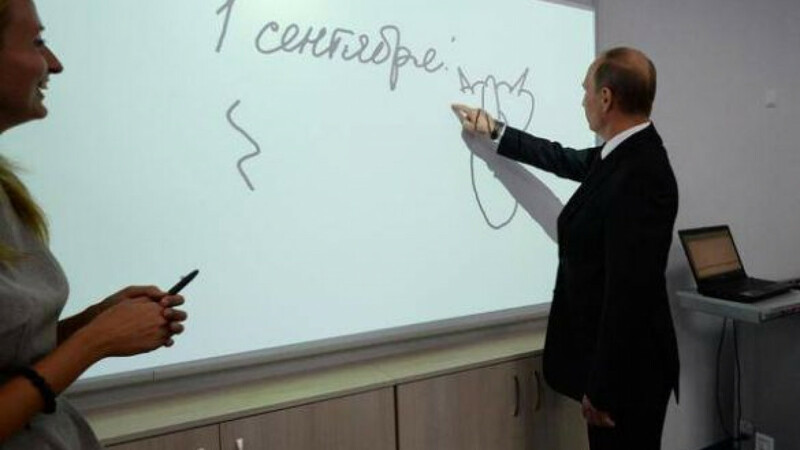 When attending a computer class the head of state began using his finger to draw a strange figure on an interactive white board, part of new technology being used at the school, RIA Novosti reported. Putin was leaving the classroom when a child asked him, "What is it?" The president replied "It's a cat. The rear view." Putin also responded to questions from students wondering how the government will stop cheating on the Unified State Exam by saying that the Education and Science Ministry is currently working on proposals. This past year answers to the test were widely available on social networks like VKontakte. The president's strange zoology lesson was not his first time at the school, which he visited in 2012 to hold a meeting on the modernization of rural education. He also criticized the pace of repairs in regional schools, for which the federal budget allocated 180 million rubles ($5.4 million).